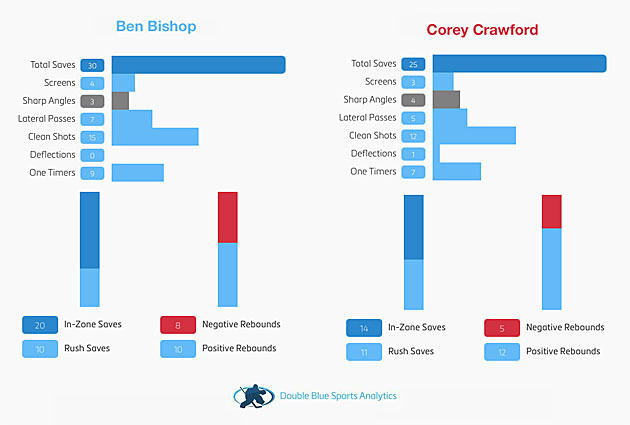 A big part of the 2015 Stanley Cup Final was the battle between 2013 Cup winner Corey Crawford of the Chicago Blackhawks and Ben Bishop of the Tampa Bay Lightning. NHL.com scouted the goalies before the series and tracked their performances each game, identifying attack trends and shot quality. Kevin Woodley, managing editor of InGoal Magazine, uses Double Blue Sports Analytics software to chart goals and shots in each game. Here are his findings from Game 6, a 2-0 Cup-clinching victory by the Blackhawks, as well as a shot quality overview of the entire Stanley Cup Final. For all the questions he's faced as the Chicago Blackhawks' No.1 goaltender, Corey Crawford has twice won the Stanley Cup. He faced more tough chances in the Stanley Cup Final than the Tampa Bay Lightning's Ben Bishop and Andrei Vasilevskiy to earn his second championship with the Blackhawks' 2-0 win in Game 6 on Monday. Chicago did a good job of keeping the Tampa Bay attackers to the outside in the Cup-clinching Game 6 victory, but Crawford came up with his best save early in the second period, staying with Tampa Bay captain Steven Stamkos on a breakaway that set the tone for his 25-save shutout. 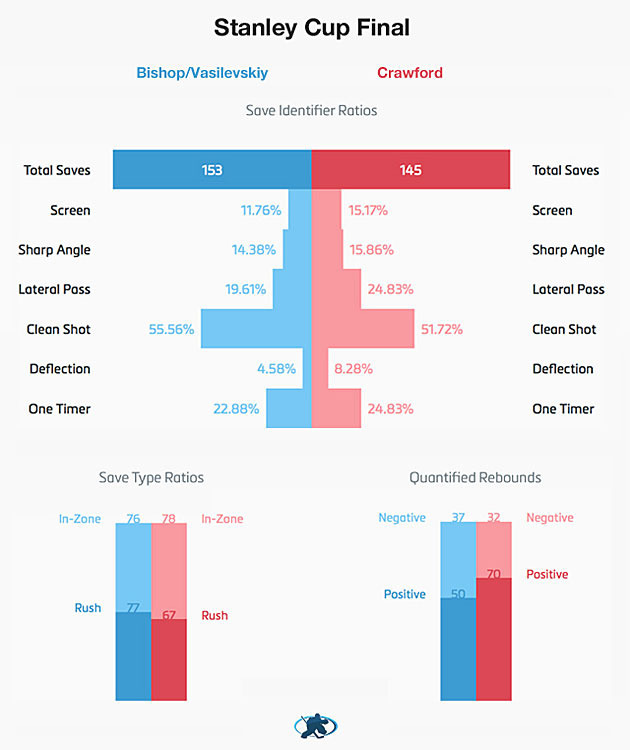 Despite an easier Game 6 compared to Bishop, Crawford faced more shots off screens (22), deflections (12), shots after lateral passes (36) and one-timers (36) in the Cup Final than Bishop and Vasilevskiy faced in the Lightning net. Lightning goalies faced 18 shots off screens, seven deflections, 35 one-timers and 30 shots off lateral passes. The only shot metric that was higher for Tampa Bay's two goalies was clean shots; they faced 85 (55.6 percent of all shots on goal), while Crawford got a clean look at 75 (51.2 percent). 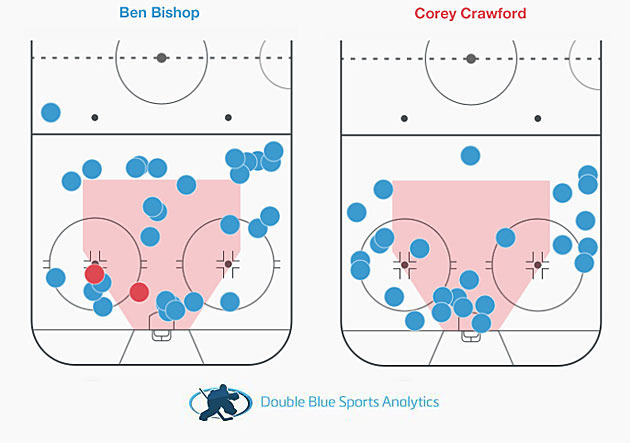 In Game 6 nine of the 25 shots Crawford faced came from within the home-plate area that extends from the edge of the crease to the faceoff dots and up to the top of the circles, but seven were from in close below the bottom hash marks and around his crease. Tampa Bay also attacked less often from sharp angles in Game 6. That had been an area where they had success early in the series but failed to convert from late when Crawford made adjustments to his post integration tactics. Bishop did his best to force a Game 7, making two great saves on lateral power-play chances for Blackhawks forwards Jonathan Toews and Teuvo Teravainen early in the game. Each play crossed the Royal Road, an imaginary line splitting the offensive zone below the top of the faceoff circles. Introduced by former NHL goalie and current MSG analyst Steve Valiquette, the Royal Road identifies tough chances that force a goalie to turn and reset his angle. Bishop faced four Royal Road chances in Game 6, the most in any Cup Final game, including the play that led to an insurance goal by Blackhawks forward Patrick Kane. Crawford stopped the three Royal Road chances he faced in Game 6, including Stamkos' breakaway move from left to right. 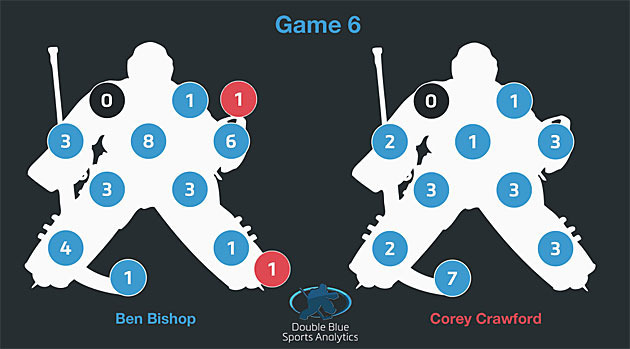 Bishop, who faced 16 shots from inside the home plate area in Game 6, didn't have much of a chance on Kane's goal. But he got caught recovering back to his skates on the game-winning goal by Blackhawks defenseman Duncan Keith. 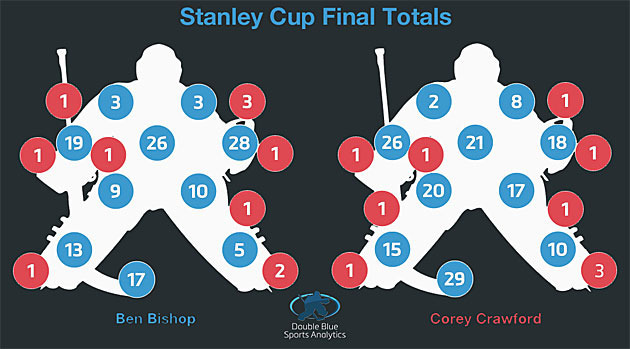 Identified as a trend going into the series, Bishop tends to get back to his skates in situations where most goalies will stay on their knees and move laterally with a butterfly push. Whether or not it was related to the torn groin he revealed after the game, the slight delay of getting back up with his left skate after already establishing a push edge with his right skate was costly in his recovery to the left. The Blackhawks fired eight shots at Bishop's glove in Game 6, part of a trend in the Cup Final that included 35 mid-to-high shots on the glove side compared to 25 in the same area on the blocker side. Things were more balanced for Crawford, who for all the talk about his glove hand during the past few years actually had more shots directed at his blocker (31) than mid-to-high on the glove side (29). Perhaps that will be enough to end some of the glove hand talk in the future. With two Stanley Cup championships to his credit now, it's probably not the only storyline Crawford quieted this season.